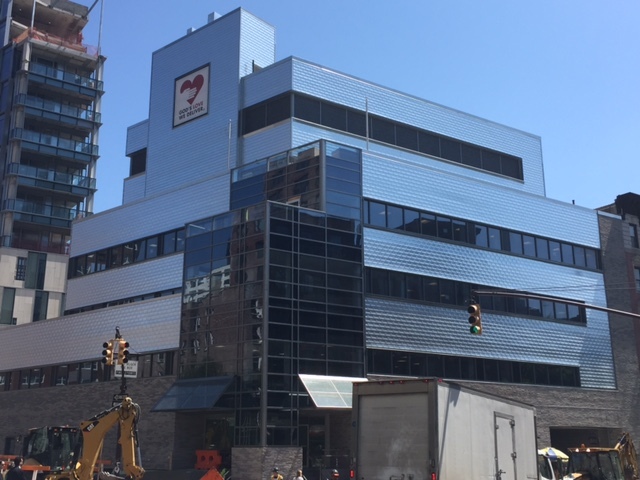 Hayden Building Maintenance Corp. completed the roof and tile metal wall project for the new headquarters of God’s Love we Deliver, at 166 Ave of the Americas NY,NY. The job entailed a green roof system for a roof top garden, SBS membrane plaza waterproofing & pavers for multiple terraces. Also installed were metal wall tiles on the entire building. nearly 10,000 square feet state of the art commercial kitchen and bakery that allows them to double the meal prodection output. An expanded delivery and pack out area with a covered loading dock. Greatly increased refrigeration and freezer space. A large volunteer lounge and terrace to welcome the growing volunteer corps. A community education space with a large board room, terrace and demonstration kitchen. The Anne and Joseph McCann rooftop herb garden for the clients’ meals. Everyday more and more vulnerable New Yorkers reach out to God’s Love looking for help. They provide all of them with life-sustaining and life- affirming services at no charge and without a waiting list. The Michael Kors building will allow them to maintain the commitment to all who need God’s Love for years to come.